Background: Despite the great emphasis on teaching professionalism in universities, creating changes in one's professional behavior is a serious challenge in medical education. In this regard, one cannot ignore the role of faculty members. The present study was set to investigate the opinions of medical education experts about the expected results of faculty development programs regarding teaching and learning professionalism. Materials and Methods: The study was carried out in two phases including content analysis study and Delphi. In the first phase, 10 medical education experts participated in the study. Data gathering was carried out using semi-structured interviews. Codes were analyzed using classic content analysis method. In the second phase, a six-member focus group and Delphi with 23 experts from across the country participated, and themes from the previous phase were confirmed and finalized. Results: Analysis of the content of the interviews in the first phase and discussing in the focus group and Delphi showed two main themes: 1) direct results and 2) indirect results with six subthemes. 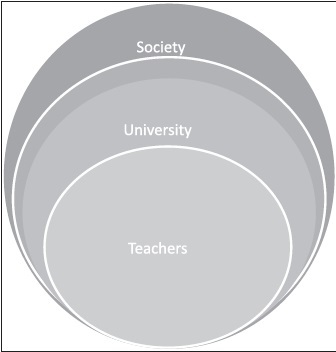 Direct results included three subthemes of creating role model faculty members, scientific improvement, improving professionalism, and inspiring the students; indirect results included three subthemes of change in educational environment of the university, change in the university system, and effects on the society's culture. Conclusion: Faculty development in professionalism can contribute to university faculty members to become better role models and inspire their students, peers, and even the society. Therefore, improving professional behavior in university faculty members can have direct and indirect effects on improving the society due to their crucial role. Background: Studies show that polyunsaturated fatty acids (PUFAs) may have an inhibitory role in carcinogenesis. It was previously shown that PLA2 group 2A (PLA2G2A) messenger RNA (mRNA) expression is associated with less frequent metastasis and longer survival in gastric adenocarcinoma. This study intends to investigate the effect of PUFAs on the expression of PLA2G2A in patients with gastric cancer. Materials and Methods: Thirty-four patients with gastric cancer (GC) were randomly divided into two groups. The first group received cisplatin medication. The second group received cisplatin medication and supplements of ω-fatty acids for three courses. The total RNA was extracted from the tissues and cDNA was synthesized. The gene expression of PLA2G2A was evaluated by the real-time polymerase chain reaction (PCR) method. To confirm the changes in gene expression, frozen section was utilized. The frozen tissue samples were sectioned and stained using the immunohistochemistry technique. Results: After chemotherapy and chemotherapy plus supplement, the relative mean of PLA2G2A gene expression increased 1.5 ± 0.5-fold and 7.4 ± 2.6-fold, respectively (P = 0.006). 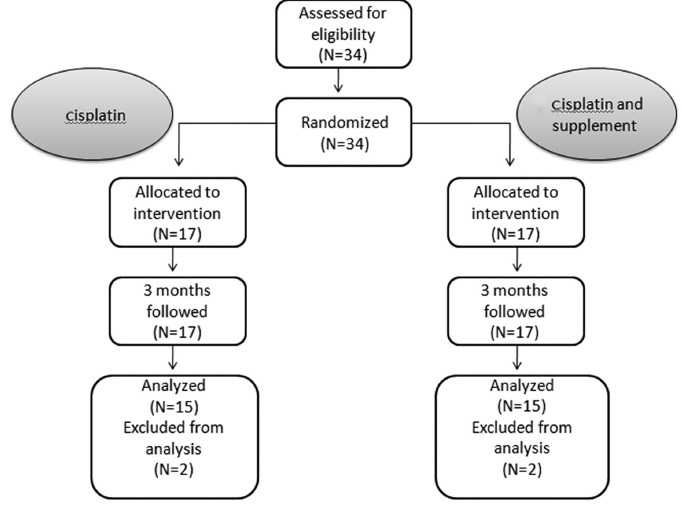 The relative mean of gene expression in patients who received cisplatin and ω-fatty acids supplement increased more significantly (7.5 ± 3.3-fold) than in patients who received only cisplatin (P = 0.016). Conclusion: It was found that PUFAs increased the gene and protein expression of PLA2G2A in gastric cancer. Concerning the fact that studies reveal protective function of PLA2G2A in gastric cancer, it is suggested that increased expression of PLA2G2A is helpful. Furthermore, PUFAs can be considered as a useful therapeutic supplement for patients with gastric cancer. Background: To investigate the effects of moderate aerobic exercise on the hemoglobin, hematocrit, and red blood cell (RBC) mass of women with rheumatoid arthritis (RA). 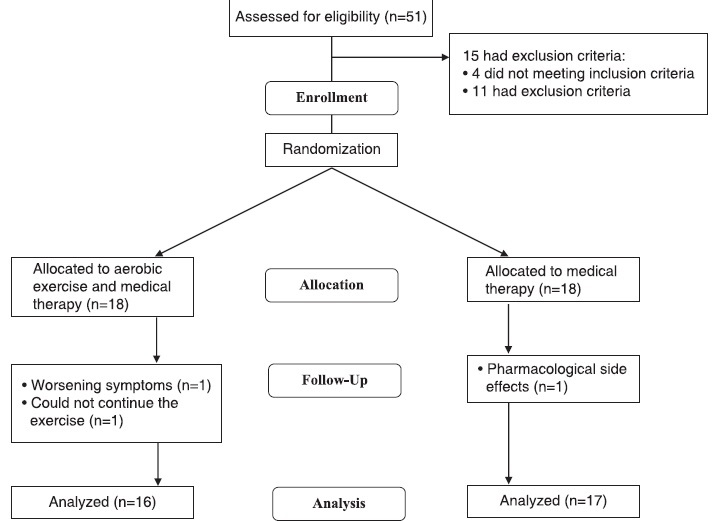 Materials and Methods: This randomized clinical trial was conducted at the Specialized Clinic of Physical Medicine and Rehabilitation, Al-Zahra Hospital of Isfahan, during a 4-month period in 2014. We included patients with RA who did not have any malignancy and hematologic disorder. Two groups - one group receiving aerobic therapy along with medical therapy (N = 16) and the other group receiving medical therapy alone (N = 17) both for a period of 8 weeks. The levels of RBC mass, Hb, and HCT were measured before and after the intervention. The changes in these parameters were compared between the two study groups. Results: There was no significant difference between the two study groups regarding the baseline characteristics. The aerobic exercise resulted in increased RBC mass (P < 0.001), Hb (P < 0.001), and HCT (P < 0.001). However, those who received medical therapy alone did not experience any significant changes in these parameters. We found that the RBC mass (P = 0.581), Hb (P = 0.882), and HCT (P = 0.471) were comparable between the two study groups after 8 weeks of intervention. Conclusion: Although the aerobic exercise results in increased Hb, HCT, and RBC mass in patients with RA, the increase was not significant when compared to that in controls. Thus, the increase in the HB, HCT, and RBC could not be attributable to aerobic exercise. Background: Type II diabetes mellitus (T2DM) is the prevalent type of diabetes in the world. Prediabetic patients are the most probable group to get diabetes. Several studies have mentioned the role of inflammation in the incidence of diabetes. The origin of inflammation can be infection such as Helicobacter pylori (HP) infection. This study was designed to explore the effect of HP eradication on insulin resistance. Materials and Methods: This single-blind randomized controlled clinical trial was conducted in 2014-2015. The sample size consisted of 49 individuals who were in prediabetes stage with HP infection. Patients with positive stool antigen were allocated randomly into two groups. The treatment group took medication to eradicate HP infection by the routine method of four-drug eradication. However, placebo capsules and tablets were given to the patients in the placebo group. Then fasting plasma glucose (FPG), fasting plasma insulin (FPI), and quantitative C-reactive protein (CRP) levels were measured and homeostatic model assessment of insulin resistance (HOMA-IR), homeostatic model assessment of beta-cell function (HOMA-B), Matsuda index, insulinogenic index, and disposition index were calculated. Results: Results of this study showed that FPI and HOMA-IR increased significantly (P value of FPI = 0.023 and P value of HOMA-IR = 0.019) after HP eradication in the treatment group. 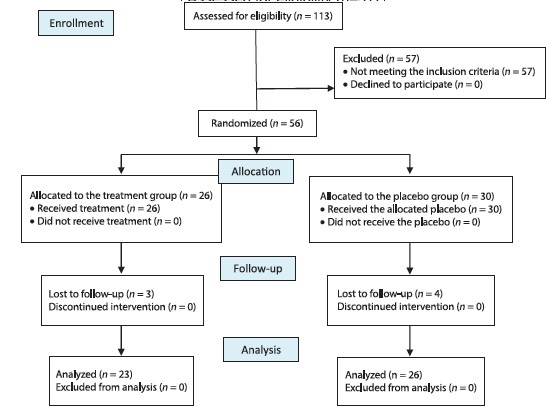 On the other hand, comparison of differences at the baseline and after 6 weeks in FPG (P value = 0.045), FPI (P value = 0.013), and HOMA-B (P value = 0.038) revealed significant differences between the placebo group and treatment group. Conclusion: Results showed that HP eradication by a 2-week antibiotic medication did not decrease insulin resistance and even increased FPI and insulin resistance indices. So HP eradication among prediabetic patients is not recommended for the decrease of insulin resistance and postponement of the development of diabetes mellitus. Background: Polycystic ovary syndrome (PCOS) is one of the common endocrine disorders in women of reproductive ages. It is associated with a range of disorders, such as dyslipidemia, hypertension, insulin resistance (IR), compensatory hyperinsulinemia, gestational, and type 2 diabetes, and increased risk of cardiovascular morbidity. There are different treatments available for PCOS. 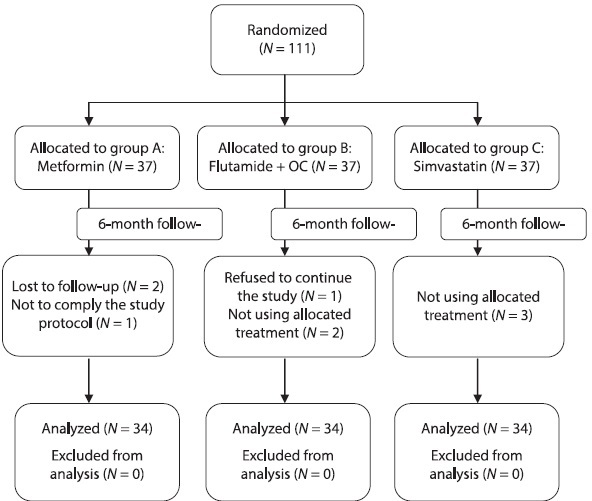 The purpose of this study was to determine and compare the effects of metformin, flutamide plus oral contraceptives (OCs), and simvastatin on the metabolic consequences of PCOS. Materials and Methods: This study was a single-blind clinical trial. The subjects were selected from a group of patient with PCOS and metabolic syndrome, who were referred to the midwifery clinic of Al-Zahra Hospital and Beheshti Hospital, Isfahan, Iran. A total of 111 subjects were randomly assigned to three groups: metformin, flutamide plus OCs, and simvastatin groups. The measurements were performed at baseline and after 6 months of therapy. Paired t-test, analysis of variance (ANOVA), and chi-square test were applied in this study. Results: A total of 102 subjects were analyzed in this study, 34 subjects were allotted in each group. The prevalence of IR was statistically different between three groups (P-value = 0.001). After a 6-month course, metformin showed larger reduction in fasting blood sugar (FBS) level (P-value < 0.001). However, except for metformin, two other treatments reduced C-reactive protein (CRP) level significantly (both P-values < 0.001). The level of triglycerides (TGs) decreased considerably in all groups (all P-values < 0.001). Both metformin and simvastatin decreased BMI significantly (both P-values < 0.001). None of the treatments changed high-density lipoprotein (HDL) level (all P-values > 0.05). Conclusion: Metformin performed better in FBS reduction. Simvastatin had better performance in terms of reducing TG level and waist circumference. Editorial: On the occasion of World Heart Day: Do we have an effective period of cardiac rehabilitation program in Iran?